There are some things you just don’t talk about among polite company. Politics, money, and apparently OEM-only GPUs. Back in July NVIDIA launched their first 40nm GPUs, and their first GPUs featuring DX10.1 support; these were the GeForce GT 220 and G 210. And if you blinked, you probably missed it. As OEM-only parts, these went into the OEM channel without any fanfare or pageantry. Today that changes. NVIDIA is moving the GT 220 and G 210 from OEM-only sales to retail, which means NVIDIA’s retail vendors can finally get in on the act and begin selling cards. 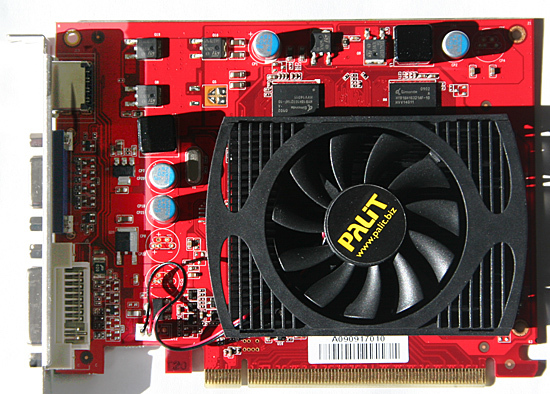 Today we are looking at one of the first of those cards, the Palit GT 220 Sonic Edition. GT 220 and G 210 are based on the GT216 and GT218 cores respectively (anyone confused yet?) which are the first and so far only 40nm members of NVIDIA’s GT200 family. These are specifically designed as low-end cards, with 48 SPs on the GT 220, and 16 SPs on the G 210. The GT 220 is designed to sit between the 9500GT and 9600GT in performance, making its closest competitor the 48SP 9600GSO. Meanwhile the G 210 is the replacement for the 9400GT. We will see multiple configurations for each card, as NVIDIA handles low-end parts somewhat looser than they do the high-end parts. GT 220 will come with DDR2, DDR3, or GDDR3 memory on a 128bit bus, with 512MB or 1GB of it. So the memory bandwidth of these cards is going to vary wildly; the DDR2 cards will be 400MHz and the GDDR3 cards may go as high as 1012MHz according to NVIDIA’s specs. G 210 meanwhile will be DDR2 and DDR3 only, again going up to 1GB. With a 64bit memory bus, it will have half the memory bandwidth of GT 220. The GPU configurations will vary too, but not as wildly. 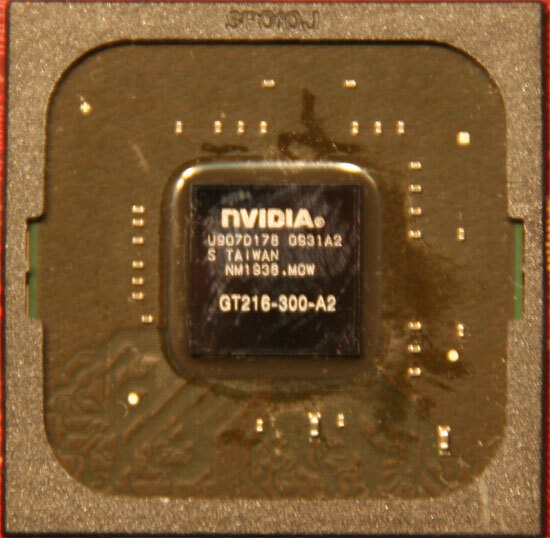 NVIDIA’s official specs call for a 625MHz core clock and a 1360MHz shader clock. We’ve seen a number of cards with a higher core clock, and a card with a lower shader clock. Based on the card we have, we’re going to consider 635Mhz/1360Mhz stock for the GPU, and 900MHz stock for GDDR3, and test accordingly. The transistor count for the GT218 die comes out to 260M, and for GT216 it’s 486M. NVIDIA would not disclose the die size to us, but having disassembled our GT 220, we estimate it to be around 100mm2. One thing we do know for sure is that along with the small die, NVIDIA has managed to knock down power consumption for the GT 220. At load the card will draw 58W, at idle it’s a tiny 7W. We don’t have the power data for the G 210, but it’s undoubtedly lower. The prices on GT 220 cards are expected to range between $69 and $79, with the cards at the top end being those with the best RAM. This puts GT 220 in competition with AMD’s Radeon HD 4600 series, and NVIDIA’s own 9600GT. The G 210 will have an approximate price of $45, putting it in range of the Radeon HD 4300/4500 series, and NVIDIA’s 9500GT. The GT 220 in particular is in an odd spot: it’s supposed to underperform the equally priced (if not slightly cheaper) 9600GT. Meanwhile the G210 is supposed to underperform the 9500GT, which is also available for $45. So NVIDIA is already starting off on the wrong foot here. Finally, availability should not be an issue. These cards have been shipping for months to OEMs, so the only thing that has really changed is that now some of them are going into the retail pool. It’s a hard launch and then some. Not that you’ll see NVIDIA celebrating; while the OEM-only launch was no-key, this launch is only low-key at best. NVIDIA didn’t send out any samples, and it wasn’t until a few days ago that we had the full technical data on these new cards. We would like to thank Palit for providing us with a GT 220 card for today’s launch, supplying us with their GT 220 Sonic Edition. "NVIDIA has yet to enable MPEG-4 ASP acceleration in their drivers"
Not true, they have not enabled it in their Windows drivers. They are enabled in the linux drivers for a little while now. Minimum width or height: 3 macroblocks (48 pixels). Maximum width or height: 128 macroblocks (2048 pixels). G 210 standard config CPU core clock is 589MHz, shaders 1402MHz. 9600GSO (G94) Memory Bus Width is 256bit not 128bit. 58W should be the figure NV is giving when GT 220 is paired with GDDR3, with DDR3 the power consumption should be a lot less. Its 40nm and has only 48sp 8rop/16tmu and still only 1360MHz shader clock.Is the TSMC 40nm this bad or what. The 55nm 128sp gt250 has 1800 Mhz shaders.